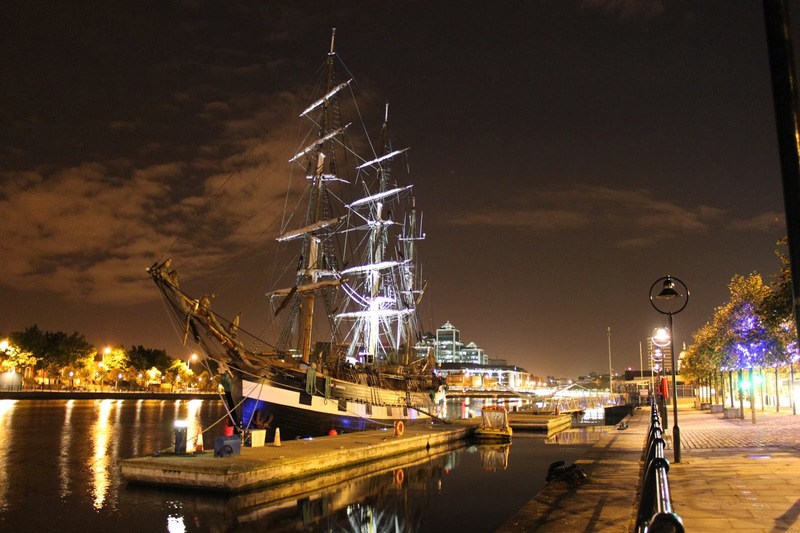 The Jeanie Johnston, a replica of a famine ship that took waves of Irish emigrants away to the shores of America. I took a Virgin 747, it was slightly faster. Custom House Quay, Dublin, 20th September, 2009. I am an emigrant. Although the distances between Dublin and London have shortened to the space between my laptop and wireless router, the fact remains that I now live elsewhere, separated from family and friends for long periods of time. The carbon-hungry age of the discount flight means that I am home so often that to the casual acquaintance it may seem like I never left, but every day that I awaken in London my life in Dublin fades more and more into the morning-banished fog of dream. I am an emigrant, and not for the first time. Over a decade ago I packed my bags and moved to America. The distances were great and in the time before Skype, the prepaid call-card was my friend. I queued up with Somalis, Eritreans and folks from the Dominican Republic at the corner shop, comparing notes on which brand offered the best rates. We swapped war-stories of encounters with the INS, of the inability of workmates to find your continent, let alone country, on a map and was commiserated with by taxi drivers on the climatic misery I had escaped from, "Ireland? I lived in London for a while, too wet. Too wet." they said, as we drove through the two-foot deep Connecticut snow drifts. I made friends, good friends that I did not expect to make. Some were also emigrants, we shared our experiences of being strangers in a very strange land, a land that got stranger still as it lurched menacingly to the Right in the aftermath of the actions of nineteen men on a bight September morning. Most were not though, being square-jawed corn-fed born and bred sons and daughters of the U.S. of A., but they too shared a sense of displacement as they moved from all across America to begin their lives anew in the elm-lined streets of New Haven. I returned in 2004 a changed man. It was not simply the consequences of age, it was the effect of the place and those people. My eyes had been widened, forcibly widened in both harmony with and opposition to the influences around me. My skills too had changed, for I had opportunities to learn, grow and develop that never would have happened at home, skills that when I did return opened up doors that never would have existed had I not left. Far from being a life-destroying social-displacement, for me emigration was one of the most positive experiences of my life. While I won't say it was better than the one I left behind, I will say that it was larger, existing on a greater scale and it truly left me a better person than had I stayed. Now, it is important here for me, as they say, to check my privileges. I am well-educated, skilled worker in the "knowledge economy " (trying to say that phrase without gagging is hard, oh so very hard) and I never emigrated alone, moving with my partner both times, so never have I faced the spectre of crippling isolation that condemns so many emigrants to a life of inescapable separateness. Had I been a day-labourer sweating out my life on the back-breaking sites of London, rather than leaning back in my Aeron chair, sipping my Frappa-mocha-chocacinnos with pinky extended, bemoaning loudly to all and sundry about the negative effect on customer projections that the NSA ad-hacking scandal will have, I no doubt would have a different opinion on the benefits of emigration. The lost generation of Kilburn, skeletal ghostmen that haunt its streets and grime-soaked formica-countered pubs, are a living testament to a shattered life that I can't even begin to comprehend. However, the fact is that as someone who has emigrated twice now, my own personal experience has been overwhelmingly positive, and I honestly believe that it has been a force for good in my life. It certainly has widened my horizons and given me a healthy dose of scepticism when it comes to all the nonsense that our parochial island life obsesses over. Anything that expands the centre of one's universe away from the local parish pump can only be a good thing. I'm a big supporter of the We're Not Leaving campaign which harnesses the determination of young people to resist the siren's call of America, Australia and the UK, and fights against the national scandal that is the Government's pro-emigration policies that seem designed to force young people up and out, each plane ticket one less number on the Live Register and one more green shoot for Enda to brag about at Davos with all his new chums. No person should ever be forced to leave out of economic, social or political necessity, but as I've mentioned before I'm tempted to start an "I'm not Coming Back" group, given that a) life elsewhere is often undeniably much better and b) it's pretty obvious that the Government is doing everything in its power to get as many of us to leave as possible, so it's hard to shake the feeling that if you're not a scion of the conservative Catholic political dynasties that run the country like their own private feudal throwback to the papal states, you're not really wanted here anyway. I've had this conversation with a fair number of fellow emigrants, and the general consensus has been that Ireland is grand for Christmas, but under no circumstances would most people contemplate returning. The aul' sod is dead to them, and few have shed any tears for it. I started to wonder if this dramatic severing of emotional ties with our homeland was something experienced only by the over-privileged group of "innovators in the smart economy" (again with the gagging) that I wallow in the digital mud with, so I decided to do a little research. Remittances are the lifeblood of much of the global economy, monies sent back from emigrants to families left behind. Often they are the sole reason people leave, saving up enough to send a single family member abroad, husbands, wives and children all left behind for years on end as the emigrant toils away at jobs that are beneath both their skill level and their dignity, sacrificing so much so that their nearest and dearest at home can have a better life. The flourishing of Western Union posters throughout the country during the Celtic Tiger told their own story of why folks came to Ireland, few considered it a permanent move, and the weekly trip to the post office or the internet shop to wire home a measure of hope was the fuel that kept them motivated for another week of work in a country that openly looked down on them. According to the World Bank's Migration and Remittances Unit (as analysed by The Guardian) around 3.2 Million Poles have emigrated in search of a better life. In 2011 they sent back $7.4bn in remittances to family and friends back in Poland, an average of $2,312 per emigrant. Poles living in Ireland actually sent back slightly more, averaging $2,400 for each of the 93,300 living here. My fellow call-card buyers from the Dominican Republic are part of a diaspora of 1 million strong, and in the same year they send back $3.6bn, or an average of $3,600 per emigrant. The 11.4m overseas Indians sent back $61.8bn, over $5,421 each. Each of the 4.3 million Fillipinos living away from home sent back an average of $5,326. 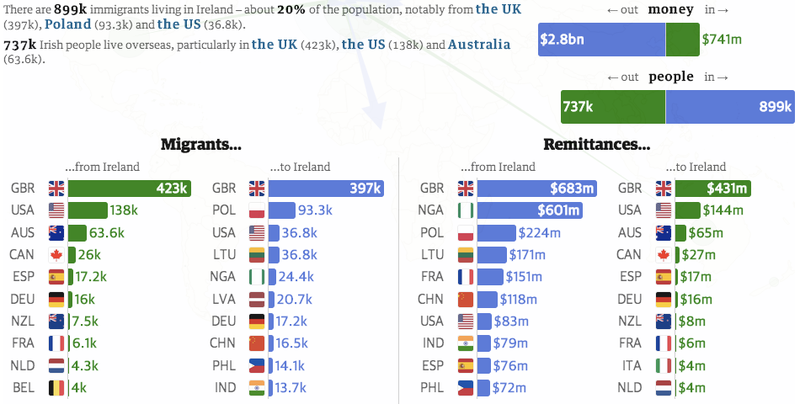 If we look at Western Europe, France is the sixth largest receiver of remittances in the world, with 1.7 million emigrants sending a staggering $11,117 each back. Spain clocked in with an average of $7,857 being sent by each of its 1.4 million emigrants. 3.5 million Italians sent home an average of $1,943 each and the 2.2 million Portuguese living abroad sent back $1,681each. And what of us? According to the World Bank there are 737,000 Irish living abroad, not the Gathering-fleecing fadó-fadó-fadó Diaspora, but actual folks born in Ireland and moved away for a new life. Given that our current population is 4.58 million, of which 877,000 are immigrants (mostly from the UK, Poland and the US), that means that close to 1 in 5 of every persons born in Ireland and alive today has emigrated. 20% of the population has gone. Just gone. And how much did this 20% of our population send back in 2011? Around $741m, roughly $1,005 per person. Of the PIGS countries only the 1.2 million fellow travellers on the Rue d'Austerity from Greece managed to send home less, with an average of $916 each. You could argue that given our young population, our emigrants also are young and in general their parents are in a better financial situation than they are, which means that Irish emigrants don't have the same level of dependants at home to support, thus remittances are unnecessary. However other countries with high levels of youth unemployment such as France and Spain still see exceptional levels of cash sent home. I would like to blame it all on the heartless policies of our current Government, burning the bridges to home in the hearts of those who have fled, but given that "only" 35,000 people left in 2012, it's clear that the bulk of Irish living abroad have been doing so since before the collapse of the Tiger and the current era of Austerity. This severing of ties is no product of our recent national nightmare, this is something that goes deeper to our core. The simple conclusion is that once we go, whatever the reason, we're gone. There is something in our psyche that says, "Sod it. You'se are all on your own now" as we walk out the door. We'll raise a glass to the Merry Ploughboy or the Bold Fenian Men when we've a skinfull on in Boston or Melbourne, but a flurry of drunken rebel songs when last orders are called is the most the Old Country can ever hope to get from us. We're a nation of Mé Féiners and never is that more apparent than when we've set up shop in other people's nations. Mary Robinson famously lit a candle in the window of the Aras to shine a path for all the emigrants to follow home. It's hard to escape the feeling that the answer she would get today is, "Thanks, but no thanks. We're happy out". The CRC, Limerick City of Culture, Irish Water, Rehab, Penalty Points and Garda whistleblowers, RTE censorship and their grovelling apology to Iona and Waters, the National Independent Party, Lucinda and her Monster Raving Luci Party, Marc Coleman and his hot older women, Enda leaning in at Davos, the O'Keeffe ruling. All of this and we're not even 30 days in to the year. Is it any wonder emigrants are "Happy out"? Would you want anything to do with a country that did all this? To be clear, I'm not trying to say that for everyone emigration is a happy thing. I'm not trying to say that the Government shouldn't be condemned for letting 35,000 people go a year and treating this as an economic recovery. I'm not trying to gloss over the very real devastation that emigration leaves in its wake for families and communities all across the country. I'm not trying to say that on a national scale emigration is anything but a preventable tragedy that shames us all. What I am trying to say is that every country lives with emigration, maybe the question here isn't why do people leave, the question we should be asking is what have we done to our emigrants that they turn their back on us so readily, and so permanently? Tune in next week I when I'll be back in Dublin, pouring scorn on those cowards who have turned and fled, instead of staying and fighting for change. I'll save you a spot on my Aeron.